There are major spoilers about Game of Thrones Season 6, Episode 5 “The Door.” If you haven’t caught the episode yet and don’t want to be spoiled on specifics, please check out one of our other lovely articles. Game of Thrones’ sixth season has had few down moments. As we’re reaching the latter part of the series, the action has become more advanced, as have the plotlines and the motivations of the various characters. Tonight, we learned more about the White Walkers and the plans of the Followers of the Lord of Light. We saw Littlefinger get knocked down a peg or two and we saw Sansa and Jon come up with a strategy to win back the North. However, none of these moments compared to a short plotline featuring Hodor’s backstory. It connects to Bran's life in more ways than we ever could have imagined, and apparently, that connection explains why Hodor only says "Hodor". In short, it’s all Bran’s fault. Bran wargs into Hodor while he is in his final training session with the Three-Eyed Raven looking back at his father’s life at Winterfell. In the cave, the White Walkers are closing in. When Bran wargs into Hodor within his vision, he is able to convince Hodor to escape with Meera. However, the White Walkers are too fast and Meera screams at Hodor to stay behind and “hold the door.” He uses his large body and his immense strength to buy Bran and Meera time. He sacrifices himself for the two youngsters, but if it wasn’t for Bran, he would never have been in the position he was in during Episode 5 in the first place. Bran literally used his powers to jump into Hodor’s mind while he was also visiting in the past. It’s an earth-shattering capability, and one that causes permanent damage to the young Hodor. Back in the past in the yard at Winterfell, Hodor begins shrieking “hold the door” over and over until it eventually slurs into “Hodor.” It's an incredibly sad moment, and it lingers long enough for viewers to appreciate how traumatic it is from multiple angles. 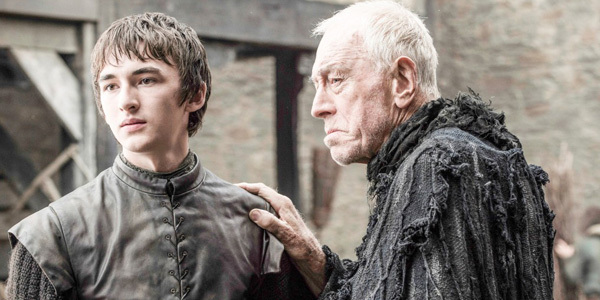 It also means Bran can have an effect on the past, for better or for worse, which could have gigantic consequences for both himself and the other characters moving forward. The Jack Bender-directed episode features a lot of plot-heavy antics, but the Hodor storyline is highly emotional and gives viewers a satisfying answer to a question many fans have long wondered about, especially since an earlier episode in Season 6 showed Hodor as a normal child. That flashback, coupled with how carefully tonight's big moment was shot, worked together to make Hodor's exit one of 2016's most affecting TV moments. That's especially important for Game Of Thrones too, because as the Red Wedding and many other big moments have proven, the show often kills off its heroes in shocking ways, rather than truly sad ones. That wasn't the case this week as we said farewell to another fallen character who sacrificed himself in an incredibly touching way. Here's to hoping it wasn't in vain. Game Of Thrones airs on Sunday nights at 9 p.m. ET, only on HBO. To find out what else is coming up on the drama, you can also check out what we know about Season 6.